A regional GIS group is holding an FME Hackathon and you have been invited to take part. You have been provided with a set of source data and asked to create a useful project from it. You decide that it would be interesting to produce a tool that maps the route from the hackathon venue to a cafe the where a group get-together will be held that evening. 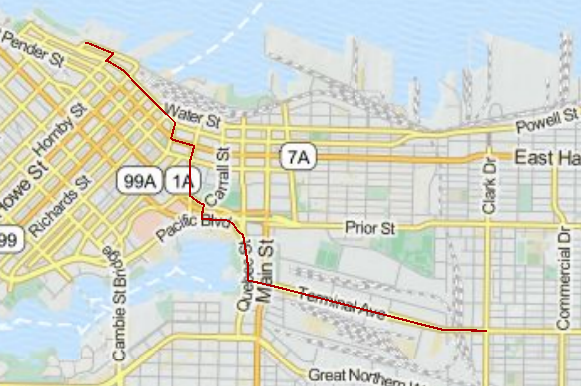 So, your task is to use the data available to you to calculate the best route from the convention centre to the cafe, and to write out that data to GPX format so folk can use it in their GPS/mobile device. The source data has been provided in a PostGIS database; therefore our first task should be to create a connection to it. That way we can use the connection instead of having to enter connection parameters. In a web browser visit http://fme.ly/database - this will show the parameters for a PostGIS database running on Amazon RDS. Click on the icon for the Database Connections category, then click the [+] button to create a new connection. In the "Add Database Connection" dialog, first select PostgreSQL as the database type. Then enter the connection parameters obtained through the web browser. 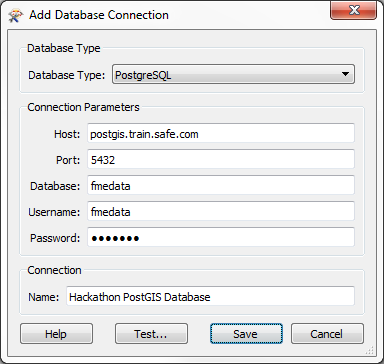 Give the connection a name (such as Hackathon PostGIS Database) and click Save. Then click OK to close the FME Options dialog. Click OK to close the dialogs and open the data. Change the color of the one-way streets so you can see that they are a different set of features. It&apos;s important to know which roads are one-way if we want to calculate a route that is actually legal! Start Workbench and use the option to Generate a workspace. For the sake of Best Practice, you may want to put a bookmark around these features, and maybe annotate which are the one-way streets. Now we need to start calculating a route. The obvious first step is to add a ShortestPathFinder transformer, which is how we can calculate our route. So, add a ShortestPathFinder transformer. Connect Roads to the Network port. The other input port on the ShortestPathFinder is for the From-To path (the start and end points of our journey). To add a feature to input here we can manually create it with the Creator transformer. Add a Creator transformer and connect it to the From-To port. Open the Creator parameters dialog. The first coordinate is that of the hackathon venue and the second is the closest point in our network to the cafe we&apos;re going to visit. The coordinates of the feature we&apos;ve added might not sit exactly on the road network. To get around this issue there are parameters we can use in the ShortestPathFinder. Also notice that there are parameters for network costs - we&apos;ll be making use of those later. Add some Inspector transformers after the ShortestPathFinder and run the workspace to prove it is working up to this point. Of course, if all has not gone correctly, you must make use of Inspector and Logger transformers, plus Feature Debugging, to try and locate the error! The result looks fine, but there are some things we are yet uncertain about: what if the route takes us the wrong way down a one-way street; and what if it uses slower, residential routes? The first issue we can fix - most quickly - by ignoring one-way streets (i.e. avoiding them). This we can implement in FME by matching up one-way streets so we can remove them from the network. Open up the ChangeDetector parameters. Note that we are matching geometry (correct) so don&apos;t change any parameters, just click OK to close the dialog. By using the ChangeDetector road features that match a one-way street will emerge from the Unchanged port, so we should leave this unconnected. 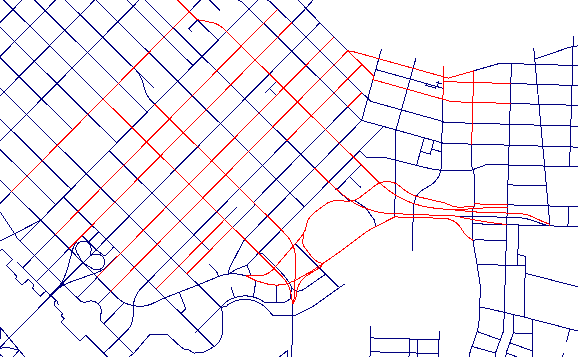 Similarly, Added features will be oneway streets that haven&apos;t been matched, and we can leave these out too. So connect the Deleted port to the ShortestPathFinder Network port. The "Deleted" features are those that the transformer thinks have been deleted because they exist as roads, but not in the one-way data. Now re-attach any Inspector transformers (if necessary) and re-run the workspace. Check the new route. If it has changed from before then you know this is because it is now avoiding oneway streets. This might not be the shortest route, but it&apos;s one we can confidently follow without heading directly into incoming traffic! To weight our route in favour of arterial roads (not residential) we need to give each type of route a cost. The best solution is an AttributeValueMapper transformer; so place one of these into the workspace. After the ChangeDetector will be the best location, as then some features will have already been filtered out and this transformer will have less work to do. Now, underneath those parameters, we&apos;ll map some data. Enter "Arterial" into the first Source Value field and a value of 1 in the matching Destination Value. 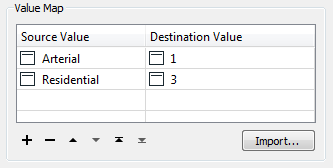 Enter "Residential" into the second Source Value field and a value of 3 in the matching Destination Value. Basically, if the route is arterial (a main road) it will get a cost of 1; residential routes will get a cost of 3 and all other types will get a cost of 2 (because that&apos;s the default value). Click OK to close the dialog. Now we&apos;ll apply that newly calculated cost in the ShortestPathFinder. Open the ShortestPathFinder parameters dialog. Set the Cost Type parameter to be "By Two Attributes". Select "Cost" as the attribute for both the Forward and Reverse cost parameters (i.e. it will cost the same whichever direction the road feature runs and whichever direction we travel along it). If we knew that the one way streets were connected in the right direction (i.e. from the first vertex to the last was the actual direction of travel) we could just set a weighting of 999 for the reverse cost and that would leave them out. Since this isn&apos;t our data we can&apos;t be sure of that, so our method is safer. Save and then run the workspace. You&apos;ll find that your new route directs you from the convention centre to Commercial Drive avoiding one-way streets and taking the slowness of residential routes into account. Now run the workspace, upload the data to your GPS device, and you are ready to go! Not really advanced, but you did use Best Practice throughout, right? I mean, you have bookmarks and annotations where needed, and no overlapping connections? If not, well you might want to fix that!